If you’re offroading every weekend, chances are you’ll have to replace your Jeep Wrangler’s fuel tank skid plate. A skid plate is a metal plate attached to the underside of your Jeep to prevent damage when you bottom out or hit a rock. You may need to replace it if you’re constantly offroading since skid plates tend to get damaged on particularly rough terrain. If the ground doesn’t damage the skid plate enough to warrant replacement, the damage can eventually lead to it rusting out over time. 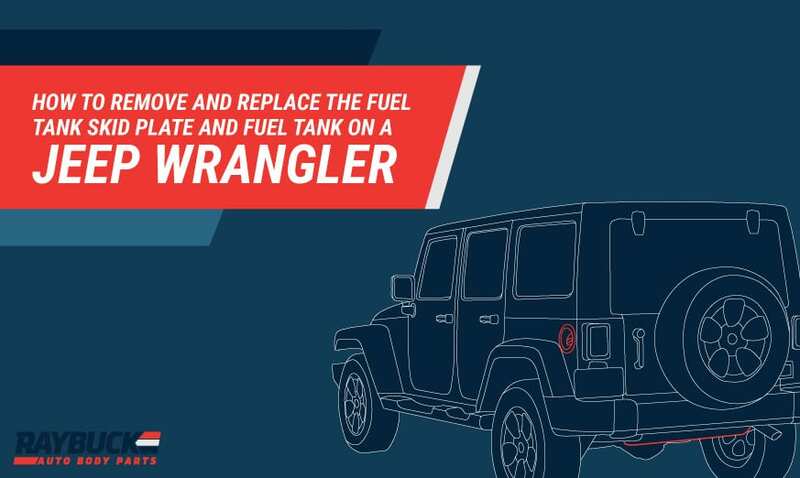 You’ll also need to remove the skid plate if you want to replace your Jeep Wrangler’s fuel tank. You will also need your Jeep Wrangler skid plate and/or fuel tank replacement. These parts are specific to your Jeep’s make, model and year. Make sure you’re buying the right skid plate or replacement fuel tank for your Jeep Wrangler — even if it looks similar to another part. Before you start taking apart your Jeep, make sure you have lots of space and all the tools you need to remove and replace the skid plate and fuel tank. Move any parts and tools you don’t need out of your way and make sure you have enough light and time to get the job done. Before you begin, take your Jeep’s tires off. This makes it easier to see all of the fuel line connections around your tank. You may want to remove your springs and shocks as well. Soak everything with penetrating lubricant — this busts loose rusted or frozen parts. It also protects parts of your Jeep from further rust and corrosion. Pro tip: If you know you have some serious rust, leave the bolts soaking in the lubricant for a day or two before you start your project if possible! 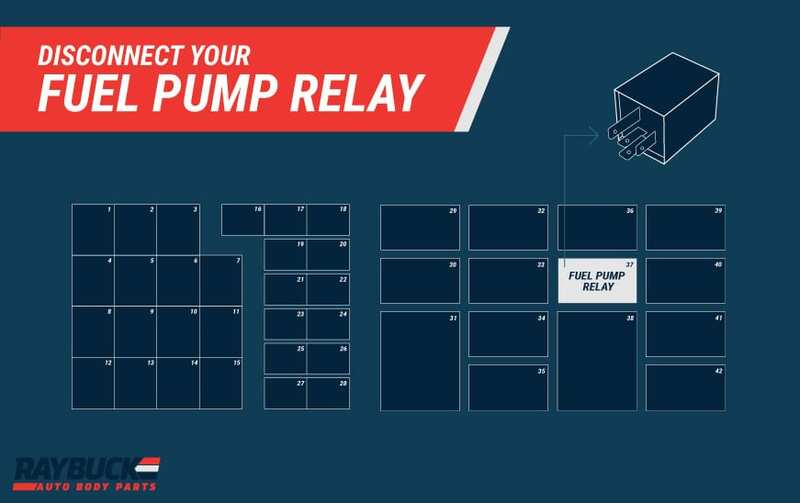 Next, remove the pressure from your fuel system by disconnecting the relay located in a black box under your Jeep’s hood. There’s a cheat sheet inside the box’s lid that shows you which relay is which. Pro tip: If you have a Wrangler, there will typically be a missing spot toward the top of the box for relays only in the Rubicon – Don’t worry, you aren’t missing any that should be there! Pull out the fuel pump relay and leave it in the top of the box under your hood to connect it again later. Try starting your Jeep to make sure the fuel pump relay is disconnected. It will start quickly, then lose pressure and die. The fuel lines underneath your Jeep are held together by simple push connectors. Look for all the lines that lead to your fuel tank and push them apart by finding the side with a push button. Pro tip: This push button is often almost flush with the rest of the connector but will be a different color. Pushing the button will free the connector, so you can pull the fuel line apart from the connector. 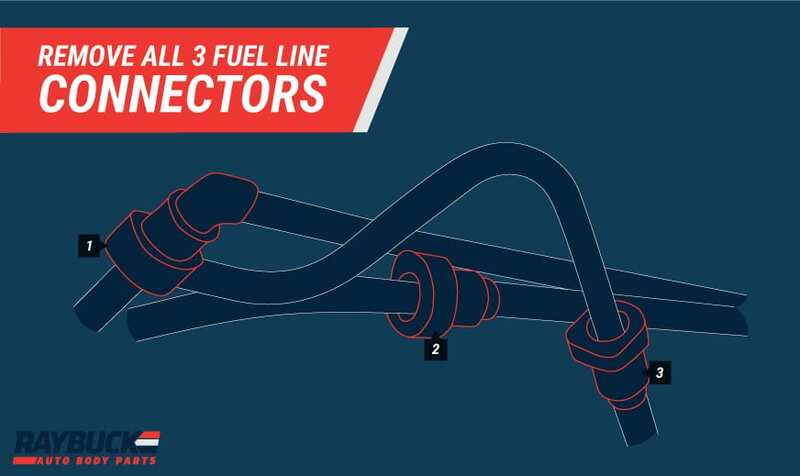 Repeat this step with all of the fuel lines connecting to your fuel tank. Remove the breather tube for your Jeep’s differential by pulling it off the differential. Remove the electrical connection next to the fuel lines and breather tube by pushing the red tab down and pulling. On the passenger side, there will be one more vent connector to remove and two more hoses. Push down on the button on the connector to release it. Pro tip: The two that are almost right under the taillight may be hard to reach. If you need to, you can wait until you start lowering the tank down to remove these – Just don’t forget about them! Next, put your 4×4 piece of wood on top of the car jack to hold the weight of the tank. Put pressure on the tank without actually lifting it. 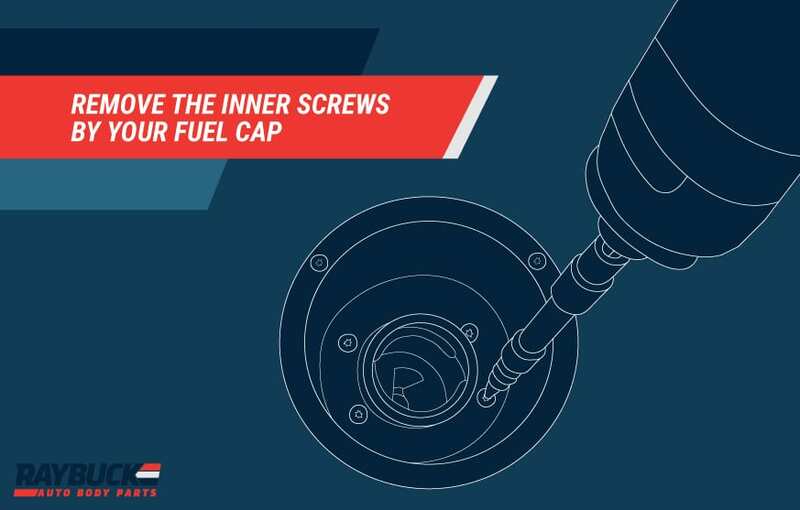 Remove your fuel cap from the side of your car’s fuel tank and take out all four inner screws using a T25 torx drill bit or wrench. Now it’s time to remove the nuts holding the fuel tank skid plate in place. Use your 12mm socket depending on how much rust there is. There are three bolts toward the front of the jeep and four bolts toward the back that you need to remove. After you remove the bolts lower the tank down using your jack. Make sure you removed all the fuel lines and other connectors before lowering the entire way down. Take out the two inner screws on the right-hand side of your driver’s side taillight using a screwdriver. 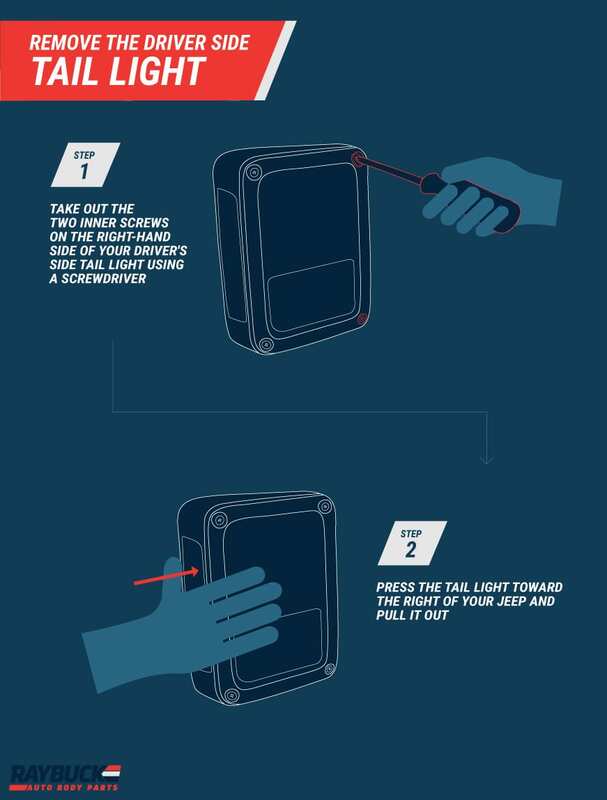 Press the taillight toward the right of your Jeep and pull it out. Take your fuel cap off and pull out the small piece attaching it to the fuel door. Remove the rubber O-ring around the fuel opening by pulling it out with your hands. Use a flashlight to find the small tabs located where the taillight once was toward the left side of your Jeep near the fuel door. Use your screwdriver to knock those tabs out, which will allow you to pull the whole fuel door out of your Jeep. Use a cloth to wipe down the outside and inside of the fuel tank and back taillight area. Line up the tabs on the new fuel door with the inside metal of your Jeep. Push those tabs in and slide the whole fuel door into place. Re-install the O-ring on top of the new fuel door. If you have trouble putting it back in, try switching steps seven and eight. Put the fuel cap back in. Re-install the taillight by pressing it in and locking it into place by pushing it to the left. Then put the two screws back in using your screwdriver. If you have any questions, contact our team here at Raybuck Auto Body Parts. We’re happy to help and give you some additional tips or pointers to assist you in the repair of your Jeep Wrangler. Do you have any tips for replacing the fuel tank skid plates, fuel tank or fuel door? Share them in the comments below!